Samar Mubarakmand, NI, HI, SI, FPAS (Urdu: ثمر مبارک مند; born 17 September 1942), is a Pakistani nuclear physicist known for his research in gamma spectroscopy and experimental development of the linear accelerator. Samar Mubarakmand was born in Rawalpindi, Punjab Province of the British Indian Empire, on 17 September 1942. He earned his education from Lahore and matriculated from the St. Anthony’s High School in 1956. After passing the university entrance exams, he enrolled at the Physics Department of Government College University where he studied physics under RM Chaudhry. He earned his undergraduate, B.Sc. degree, in Physics in 1958, and entered in the post-graduate school of Government College University. He conducted his research at the High Tension Laboratory (HTL), and his master’s thesis contained the detail work on the construction and development of the Gamma ray spectrometer. His master’s thesis was supervised under the close collaboration of RM Chaudhry and subsequently awarded the M.Sc. in Nuclear physics in 1962 from Government College University. In 1962, he won a doctoral scholarship and commenced doctoral research at Oxford University. At Oxford, he studied Compton scattering and the dynamical theory of Gamma spectroscopy with Shaukat Hameed Khan. After his long doctoral research, he submitted his doctoral thesis on experimental nuclear physics and was awarded his PhD in experimental nuclear physics from the University of Oxford in 1966 under the renowned nuclear physicist D. H. Wilkinson. During his time in Oxford, Mubarakmand closely collaborated and studied with Shaukat Hameed Khan at the Physics Department, learning about the Linear accelerators, and after returning to Pakistan he built one. At Oxford, he was part of the team that commissioned a 22 million volt atomic accelerator. After returning to Pakistan, Mubarakmand was posted by the government at the Pakistan Atomic Energy Commission in 1966. In 1966, he was encouraged by senior scientist Naeem Ahmad Khan to join the Pakistan Institute of Nuclear Science and Technology (PINSTECH) to do his post-doctoral research in physics. In 1967, he was joined the “Nuclear Physics Group” (NPG) working under the direction of Naeem Ahmad Khan, and had worked closely on Bashiruddin Mahmood and Hafeez Qureshi on engineering problems involving the reactor physics and the methods involving the gas centrifuges. In January 1972, Mubarakmand was assigned to Ishfaq Ahmad’s Nuclear Physics Division where he immersed himself in work on the project’s physics calculations in implosion method, and mathematical multiplication involved in nuclear fission. In 1974, on the advice of Abdus Salam, the PAEC had formed the Fast Neutron Physics Group, and had impressed Ahmad enough to be made a group’s founding director. As a junior physicist, he was the greater part of his work was to conclude the calculation of neutron energy’s distributive ranges and power produced by the neutrons, after the detonation process. In September 1973, Mubarakmand then began the work onsimultaneity, key calculations involving to investigate detonation of the weapon from several points at the same time, but the calculations were distributed among the Mathematics group under Asghar Qadir, and the Theoretical Physics Group (TPG) under Abdus Salam and Riazuddin as it felt that the calculations would be better off, as it involved complex mathematical and physics applications of Einstein’s Special and General relativity. Later, Mubarakmand assisted in developing the first high performancesupercomputing programs at the PAEC. In 1978, Mubarakmand led the construction of a nuclear and particle linear accelerator, and the neutron generator at the secret Pinstech Laboratory. In 1980, Mubarakmand was elevated as the director of the diagnostic group that was charged with the test teams, and was made responsible for the countdown for the detonation of the weapon. On March 11 of 1983, Mubarakmand was one of the few scientists that were invited to eye-witnessed the cold test of theoretically designed weapon, codename Kirana-I. Mubarakmand led the countdown of the weapon while TPG and MPG calculated the yield. In 1987, Mubarakmand was transferred to the Directorate for Technical Development(DTD) — a secret directorate to develop explosive lenses and triggering mechanism for the fission weapon. There, along with Hafeez Qureshi, Mubarakmand provided the technical assistance to the engineers there. At Pinstech Laboratory, Mubarakmand built another nuclear accelerator to conduct studies of an explosion process in a fission weapon. For his own role in the project and DTD, Mubarakmand later concluded: “Engineer people (referring to Hafeez Qureshi and Zaman Sheikh), at DTD, were really smart. They were trained very thoroughly in the development of a weapon’s necessary materials at very low cost. As many as nineteen steps were involved in the making of a nuclear weapon ranging from exploration of uranium to the finished device and its trigger mechanism.The technological and manpower infrastructure for eighteen out of these nineteen steps were provided by the PAEC under the leadership of Munir Ahmad Khan who led it for nearly two decades from 1972 to 1991. Today all the major key scientific organizations linked to the country’s security like the PAEC, the Kahuta Research Labs and the strategic production complex were run and operated by Pakistani professionals produced by the policies of the PAEC both under him and Usmani of producing indigenous trained manpower. Pakistan’s nuclear capability was confirmed the day in 1983 when the PAEC carried out cold nuclear tests under the guidance and stewardship of late Munir Ahmad Khan. The tests however, were not publicly announced because of the international environment of stiff sanctions against countries, which sought to acquire nuclear capability…. After his active role in Pakistan’s integrated atomic bomb project, Mubarakmand took personal initiatives in the development of the space program where he largely contributed his research in computational fluid dynamics, aerodynamics, and fluid physics. In Pakistan’s scientific circle, he is known as father of Pakistan’s missile program where he has reportedly been present at the flight test facilities of Pakistan. In 1987, Ministry of Defence, jointly collaborating with Ministry of Science, initiated the integrated missile program, an equivalent program to India’s Integrated Guided Missile Development Program (IGMDP). The government assigned the projects to be jointly led under the leadership of Samar Mubarakmand and Abdul Qadeer Khan. In 1995, Mubarakmand became chief project coordinator of Shaheen program, and the following year, Mubarakmand was made director of the missile program. Mubarakmand’s team successfully developed the solid boosters and solid engine for Shaheen-I program. This was later followed by developing the Shaheen-II, Shaheen-III, Babur missile, and theGhaznavi missile system. As a “Science and Technology” member at the Planning Commission of Pakistan, he has been staunch supporter of rocket science in the country. Talking to the media on August 18, 2009, Mubarakmand has Pakistan would launch its own satellite in April 2011 it made some things seem all to obvious to analyst familiar with the subject. He described the satellite as being able to monitor agricultural programs, minerals programs and weather conditions and that it was funded by the Pakistani Planning Commission. He went on to say there were sufficient funds for the defense, nuclear and space programs. Whether this will be a less than 100 kg first test satellite or a much heavier satellite remains to be seen. Mubarakmand is currently supervising coal mining practiced on scientific lines for the Thar Coal Power Project. Samar Mubarakmand is widely cr .ed with bringing modernization in the design and development of many components and instruments that are the backbone of Pakistan’s nuclear and missile technology. Mubarakmand is honored with Pakistan’s highest civilian awards; Sitara-e-Imtiaz in 1993; followed by Hilal-e-Imtiaz in 1998 and the Nishan-e-Imtiaz in 2003. In 2000, he secured the fellowship of the Pakistan Academy of Sciences (PAS), and was inducted by his mentor Ishfaq Ahmad. 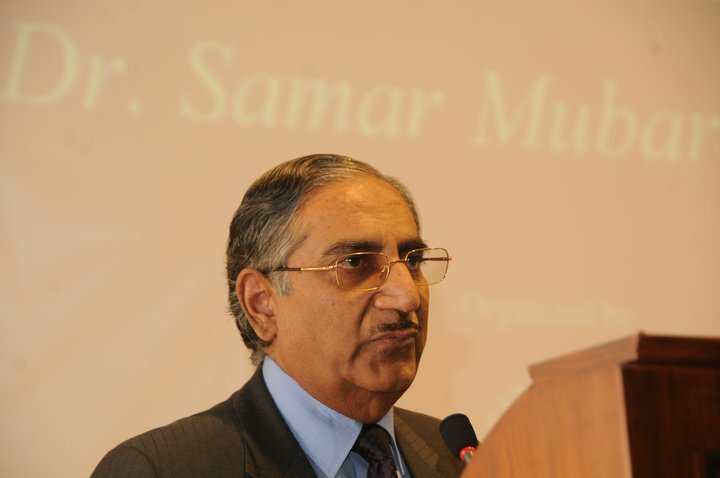 In 2007, Samar Mubarakmand was promoted to government portfolio and held the office of the special assistant to the Prime minister on Science and Technology which he held until April 2008. On 16 December 2008, he was sent to join the Planning Commission as a member of the science and technology bureau headed by his mentor, Ishfaq Ahmad, since 2008. “A Science Oddyssey: Pakistans Nuclear Emergence”, Samar Mubarakmand, Khalil Qureshi, Masoor Beg, Masud Ahmad. Aspects of a-emission from the bombardment of 58Ni with 14.7 MeV neutrons, by Naeem Ahmad Khan, Samar Mubarakmand and Masud Ahmed, journal of Nuclear physics, PINSTECH. Cross-section measurements with a neutron generator by Samar Mubarakmand, Masud Ahmad, M. Anwar and M. S. Chaudhry. Some characteristic differences between the etch pits due to 86Rn and 232 Th α particles in CA80–15 and LR–115 cellulose nitrate track detectors, by Hameed Ahmad Khan, M. Afzal, P. Chaudhary, Samar Mubarakmand, F. I. Nagi and A.Waheed, journal of Isotopic Radiation, PINSTECH (1977). Etching of glass solid state nuclear track detectors in aqueous solutions of (4NH)2HF, NaOH and KOH, by Hameed Ahmad Khan, R. A. Akbar, A. Waheed, P. Chaudhry and Samar Mubarakmand, journal of Isotopic Radiation, PINSTECH (1978). Derivation of a mathematical relationship between the relative movement of point charges and their associated viscosic medium – Dr. Samar Mubarakmand, Fahad Shiftra and Prof. Ian. Samar Mubarakmand’s response on the day when Pakistan complete its nuclear task of explosion on May 28, 1998. “ Wherever you go and whatever ends you pursue, you must always fulfill the trust reposed in you by your nation, your parents and your alma mater. Shahid H. Bokhari (born January 17, 1952 in Lahore, Pakistan ) is a highly cited Pakistani researcher in the field of parallel anddistributed computing. He is a fellow of both IEEE and ACM. Bokhari’s ACM Fellow citation states that he received the award for his “research contributions to automatic load balancing and partitioning of distributed processes”, while his IEEE Fellow award recognizes his “contributions to the mapping problem in parallel and distributed computing”. A biography of Bokhari can be found at the Department of Biomedical Informatics, Ohio State University, where Dr. Bokhari has been a visiting researcher. Shahid Bokhari received his B.Sc. in Electrical Engineering from the University of Engineering and Technology, Lahore in 1974. He then received his M.S. and Ph.D. in Electrical and Computer Engineering from the University of Massachusetts Amherst in 1976 and 1978, respectively. He was with the Department of Electrical Engineering, University of Engineering and Technology, Lahore, Pakistan from 1980 to 2005 where he held the position of a Professor. He also served as Director of the Computer Systems Laboratory, Communications Laboratory and the Postgraduate Program at the Department of Electrical Engineering as well as the Directorate of Research Extension & Advisory Services of the University of Engineering and Technology, Lahore. He purportedly tendered his resignation from the Department of Electrical Engineering University of Engineering and Technology, Lahore over a dispute with the administration, notably the Vice-Chancellor Lt. Gen. (retd.) M. Akram and the Chairman of Department of Electrical Engineering, and dissatisfaction with the policies of the country’s Higher Education Commission (HEC). Bokhari maintains he did not resign under protest for not being appointed Chairman of Department, although his critics claim otherwise. Bokhari has been associated with the Institute for Computer Applications in Science & Engineering (ICASE) at NASA Langley Research Center in Hampton, Virginia, where he spent a total of about seven years as a visiting scientist or consultant over the period 1978-1998. Other institutions that he has been associated with as a researcher include the University of Colorado (USA), Stuttgart University (Germany), University of Vienna (Austria), and the Electro technical Laboratory in Tsukuba, Japan. Bokhari’s research interests include parallel and distributed computing, applied to computational biology and bioinformatics. He is, particularly, interested in parallel algorithms for DNA alignment and assembly. One of Bokhari’s most-cited research publication: “On the Mapping Problem” (1981) concerns the assignment of subtasks for distributed computation to processors in such a way that the subtasks that communicate with each other are, to the extent possible, assigned to the processors that are adjacent to each other within the communication network. His paper relates this problem to more abstract graph-theoretical problems, in particular, graph isomorphism. He also relates the problem to the representation of sparse linear systems as band matrices with low bandwidth, and to the quadratic assignment problem. This is the work for which Bokhari was cited in his IEEE Fellow award. Several other highly cited papers of Bokhari concern the partitioning and load balancing problems in distributed computing, the topic mentioned in his ACM Fellow award citation. As with the Mapping Problem, this concerns assignment of tasks to processors, but in a more general setting in which a processor may handle multiple tasks; the problem is to perform this assignment in such a way that heavily communicating pairs of tasks are assigned to the same processor, while keeping the amount of work assigned to processors relatively even. Bokhari’s research with Marsha Berger (Berger and Bokhari 1987) concerns versions of the partitioning problem in which different tasks may have greatly differing workloads; he gives as an application the distributed solution of nonlinear partial differential equations. The technique introduced in this paper, recursive coordinate bisection, repeatedly divides the geometric problem domain along coordinate axes into two sub domains of equal workload until the number of sub domains formed equals the number of processors. However, as Simon writes, although this method is conceptually very simple it tends to produce long and thin or even disconnected subdomains. A later refinement of this technique, parametric binary dissection (Bokhari, Crockett, and Nicol 1993) combines shape information with load balancing in its partitioning decisions in an attempt to mitigate this problem. Another of Bokhari’s papers (Bokhari 1988), his third most-highly cited, provides an algorithm that optimally solves the partitioning problem for several broad classes of distributed algorithm. Bokhari, Shahid H. (1987). Assignment Problems in Parallel and Distributed Computing. Boston: Kluwer Academic Publishers. ISBN 0-89838-240-8. 95 citations. Bokhari, Shahid H.; Stone, Harold (1978). “Control of distributed processes”. IEEE Computer 11 (7): 97–106. 45 citations. Bokhari, Shahid H. (1979). “Dual processor scheduling with dynamic reassignment”. IEEE Transactions on Software Engineering SE–5 (4): 341–349.doi:10.1109/TSE.1979.234201. 41 citations. Bokhari, Shahid H. (1981). “On the mapping problem”. IEEE Transactions on Computers C–30 (3): 207–214. doi:10.1109/TC.1981.1675756. 245 citations. Bokhari, Shahid H. (1981). “A shortest tree algorithm for optimal assignments across space and time in a distributed processor system”. IEEE Transactions on Software Engineering SE–7 (11): 583–589. doi:10.1109/TSE.1981.226469. 73 citations. Bokhari, Shahid H. (1984). “Finding maximum on an array processor with a global bus”. IEEE Transactions on Computers C–33 (2): 133–139.doi:10.1109/TC.1984.1676405. 61 citations. Berger, Marsha; Bokhari, Shahid H. (1987). “A partitioning strategy for non-uniform problems across multiprocessors”. IEEE Transactions on Computers C–36 (5): 570–580.doi:10.1109/TC.1987.1676942. 298 citations. Bokhari, Shahid H. (1988). “Partitioning problems in parallel, pipelined and distributed computing”. IEEE Transactions on Computers C–37 (1): 48–57. doi:10.1109/12.75137.140 citations. Bokhari, Shahid H. (1990). Communication overheads on the Intel iPSC-860 hypercube. ICASE Interim Report 10. 49 citations. Berryman, H.; Bokhari, Shahid H. (1992). “Complete exchange on a circuit-switched mesh”. Proceedings of the Scalable High Performance Computing Conference. pp. 300–306. 49 citations. A longer list of his publications is available from the DBLP Bibliography Server. Citation counts are derived from a Google Scholar search.